San Francisco is one of the most interesting American cities: full of creativity, neighborhoods with their own quirky identities, and one of the most stunning locations in the world. The Beat Movement, the Hippie scene, Gay Pride, Silicon Valley: lots of influential ideas got their start in the San Francisco area. Add to that the typical tourist landmarks like the Golden Gate Bridge, the cable cars, Fisherman's Wharf and Chinatown, and you've got a great destination. Most people look forward to any chance to visit this fascinating place. 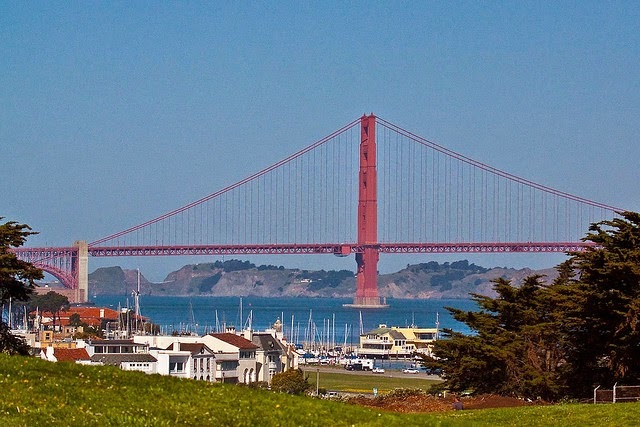 If you're lucky enough to be heading to San Francisco, here is a short list of some of the best running routes in the city. So here they are, the four best routes in this great town. Marina Green to Fort Point: Here's a scenic waterfront route along the north shore, with a great view of the Golden Gate Bridge. Downtown route: This one starts in the heart of town, at Union Square, and loops past the Embarcadero, then up through Chinatown and Nob Hill. There's a hill-climb on the last part here, but you can skip the hill if you want. Golden Gate Park: This route begins in Haight-Ashbury and then loops beautiful Golden Gate Park, including a stretch of Pacific beach at the halfway point. North Shore / Telegraph Hill: If you don't mind a flight of stairs taking you up Telegraph Hill, this interesting route starts at Fishermans Wharf, winds past some other piers until taking the stairs through the cliffside jungles of Telegraph Hill to Coit Tower, then heads back through North Beach, along the famous serpentines of Lombard Street.